My Facebook/Instagram/Tweeter posting habits have changed over these past four years. 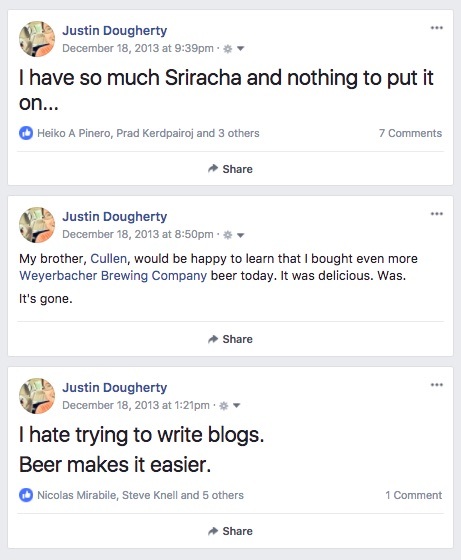 For one, I’m not a college student writing a dissertation anymore (as I was at that point back in 2013). For another, I have a job, and an income, that largely depends on my reputation and word-of-mouth. This means that I feel the need to be conscious of my public persona, which leads to quite a few quandaries in my personal relationships with students and their parents. I have religious and political beliefs and opinions. They’re pretty strong. A quick scroll through my Twitter feed prior to November 8, 2016 will betray my political leanings. If a student’s parents aren’t sure if I voted for Romney or Obama, Hillary or The Donald, or if I “believe” in Climate Change, then I’m on the right track. Students who come to my house for lessons are herded away from private areas and into the cello room. If students think I’m home alone (or live alone), I’ve succeeded in my efforts. Talk of money is a constant balancing act. I don’t want anyone to know how much (or little) money I make. I don’t post my fees online, nor do I give out that information to people who ask. That said, any mathematically inclined student or parent could come up with a rough estimate, if it so pleased them. I tend to think that this is what it’s like to be a member of polite society. Those things we all hate to talk about at Thanksgiving dinner are the things I keep out of my professional relationships. The reason I’ve chosen to keep my personal life and thoughts to myself all this time are largely economic: we live in such a polarized world that I feared details about my personal life and personal opinions would lead to students quitting lessons - or worse, not signing up at all. Some students/parents may not like the idea that I voted for Hillary in 2016, or that the guy who may be cooking in the kitchen or watching TV in the living room during their lesson isn’t my taller, skinnier, blonder brother. But these days, I’m starting to think that it’s necessary to let people into my life a wee bit more if I’m going to develop strong personal and professional relationships with my students and their parents. Hiding is hard. Setting up boundaries with people I’m asking to trust and listen to me makes it difficult to do my job well. And when it comes to professional opportunities, musicians and music teachers like me need to be more willing to be honest with our contractors and customers. I’m a product of good and bad teachers. I’ve had my share of both throughout my cellistic life. The best teachers I’ve had were not only excellent pedagogues, but also welcomed me into their lives, either by sharing (or listening to) gripes about daily life, meaningless gossip, or personal details. The worst teachers I’ve had were not necessarily poor instructors, but were the least likely to engage with me, their student, on a personal level. I’m afraid that my hesitance to be personally closer with some students and parents has manifested itself as one of the poor teacher-student relationships that I remember from my earlier life. While boundaries are necessary - these kids are STILL in middle/high school, and ARE my students, not my friends - I’ve been trying to be more open. Recently, a student was our house sitter when we went on vacation. I’m sure (because he’s told me) another would have quit the cello were our relationship in lessons not so good. I drink bourbon with one of my student’s fathers. One mother and I chat about vacation plans and whether or not we’ll be out on Lake Lanier this weekend or that. There’s a possibility of backlash from this spirit of openness with students, too. Some students might quit if they learn things about me that they find unsavory. Would it surprise you to know that some people do not drink, and are morally opposed to it? Well, they exist, but they’re just going to have to ignore my wine fridge. Did you know that we live in a hyper-partisan world and there will be some who don’t like my streak of votes for a Democrat for President? Sorry; I swear, I’m a cool guy even if I did vote for John Kerry. Oh, also, that dude's name is Jake, and he lives here. We share bank accounts. I think that other musicians and teachers would benefit from this small amount of openness, even if they, like me, worry about the potential side effects. Whether it’s demanding the long overdue check from a church gig, or speaking up when a student or parent says something that might be more than a bit prejudiced, it’s gonna be fine. Just be honest. Thankfully, I’m not in the same precarious financial place that I was a few years ago, right after grad school, so I can afford to lose some students should my predilection for Pacific Northwest reds rub them the wrong way. I don't think I'll ever be terribly good at this "relationship with students" thing, especially because most are so young, but I'm working on it. I'm not too terribly worried about it either. My reputation as a teacher is good enough, I think. Any students who don’t like, say, our secular and tastefully decorated Holiday Tree will be replaced by students with whom I will develop a tight bond and great cello technique.